BEFORE: On the docket for today is George Lucas’ feature film adaptation of his short film Electronic Labyrinth: THX 1138 4EB. The feature film, THX 1138, is the first of a pair of 1970s science fiction films leading in to a much larger chain of films later on this week. It’s all really a bunch of potpourri so THX 1138 could fit in but I’ll talk more about the chain on Friday when there’s more of a concrete theme. I have seen the student film. It was certainly very interesting and achieved a level of originality, but it wasn’t the best of stories; there was just a lot left unknown. 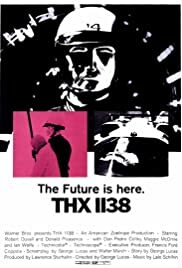 From what I understand, THX 1138 fleshes out the framework of the student film into a more detailed narrative. I’m looking forward to learning more about this mysterious world. AFTER: I have some very mixed feelings about this film. First and foremost, there’s the visual effects. Right from the beginning, I was simultaneously amazed and disappointed. Everything appeared to be done at a level far above 2001: A Space Odyssey which was released in 1969, two years prior, and even Lucas’ own Star Wars which was released in 1977, six years after THX 1138. So my thoughts immediately went from, “Wow! What impressive visual effects,” to “Oh great. George did it again. He touched-up one of his old classics so it can look better. I don’t care what you say George, Han shot… oh, wrong film. Carry on.” I’m not going to get into the debate of whether Lucas should or should not alter his films. They’re his property, he has the right to do with them what he wants even if we fans demand he maintain the original versions. I’m not saying the alterations were bad. If anything they were done very well. But they did not fit in with the rest of the film and as a result, it took me out of the experience and had me focused on the visuals instead of the story. And speaking of story, did it explain unanswered questions from Electronic Labyrinth or did it just spew more ambiguity? Well it certainly was very ambiguous, but the world was also fleshed out quite a bit. We get to know more about the people (rather numbers with attached prefixes; read: THX 1138 and LUH 3417) and more importantly the lives they live. What I found incredibly interesting was the pacing. The film felt as if it flew by, but it also seemed to go nowhere. In other words, the story didn’t seem to match the duration. Many scenes seemed to drag on and go nowhere but I was surprised when I checked the clock for the first time and an hour had already elapsed. If you’ve seen the short film, definitely see THX 1138; it’s a great addendum to this complex world. If you haven’t, it’s still a pretty good film to watch but you may feel out of place during some scenes.